You are currently browsing the tag archive for the ‘Border and Immigration Agency’ tag. The next regular picket of the Home Office’s ‘Border and Immigration Agency’ in Cardiff will take place on Tuesday 20th May at 12 noon at 31-33 Newport Road (General Buildings, see map). Take a break from work/study/sitting in the park to join us and demonstrate your solidarity with migrants and show that they are welcome! 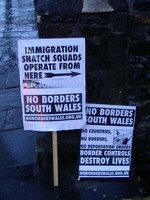 There was a good turn out for the latest picket of the Border and Immigration Agency in Cardiff on 15th April. From 12 noon, around 200 flyers were handed out to passers by and those required to sign at the offices while their asylum claim is processed. Unusually, we had no intervention from BIA employees or the Group 4 security people who, in the past, have asked us to take down our banners, told us to “get a job” and also blamed the country’s problems on the people who sign at this office. Please join us for the next picket! Date to be announced. 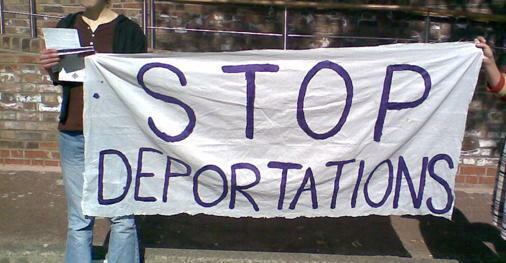 Picket the Border & Immigration Agency! A further picket of the Border and Immigration Agency, General Buildings, 31-33 Newport Road, Cardiff will take place on 25th March, 12noon. 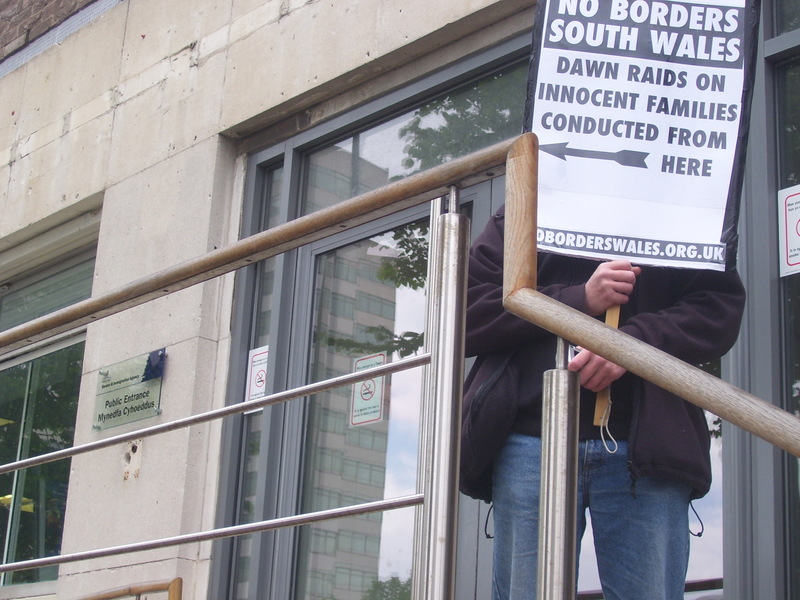 A group of activists from No Borders Wales placed a banner on the Border and Immigration agency building in Cardiff on tuesday sept 11 and gave out over two hundred leaflets to passers by, and to users of the premises. Asylum seekers are forced to attend the centre to sign documents and receive a service which was described by one asylum seeker as “horrific”. 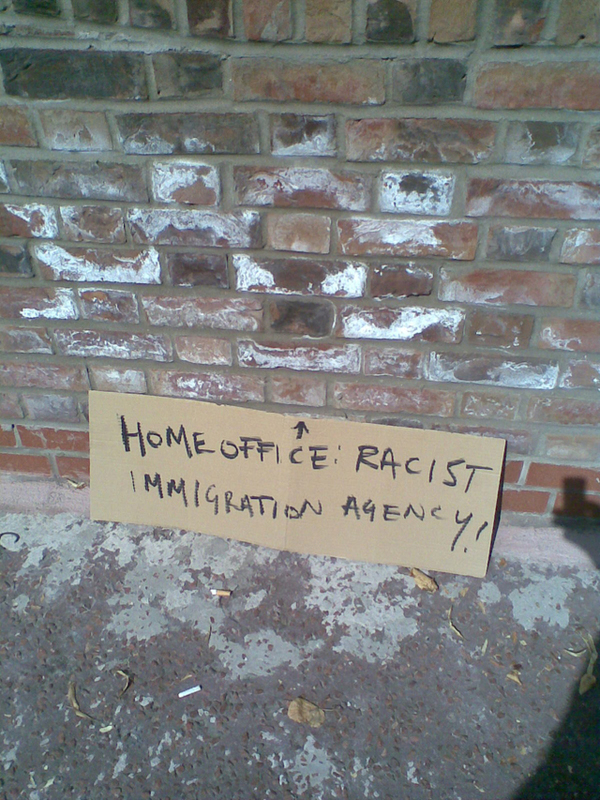 Members of the public were informed of the buildings use as part of the UK’s racist immigration apparatus. 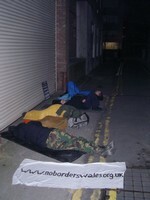 No Borders Wales intend to picket this building regularly to ensure that what goes on inside becomes generally known.